Six Flags Fiesta Texas has been open since 1992. It is a traditional Six Flags park with an attached water park. The park has 15 attractions listed as “Thrill Rides” excluding the water park. All of the thrill rides are well done. Some like Pandemonium are showing their age, not that they are not fun but just need refreshing with new theming. The newest thrill ride in 2015 is “Batman”. I must say it is fun and the flips and drops keep you on edge. I will say that the cue needs more shade. We were there in July and that was a brutal 45 minute wait in the sun. Our group of 4 were split on our favorite thrill ride. Elizabeth voted for Batman, Ben and myself voted for Iron Rattler, and Chase voted for Superman. Since Iron Rattler got 2 votes, I’ll go their next. The Rattler was a traditional wooden coaster, until it was rebuilt as a hybrid opening in 2013. 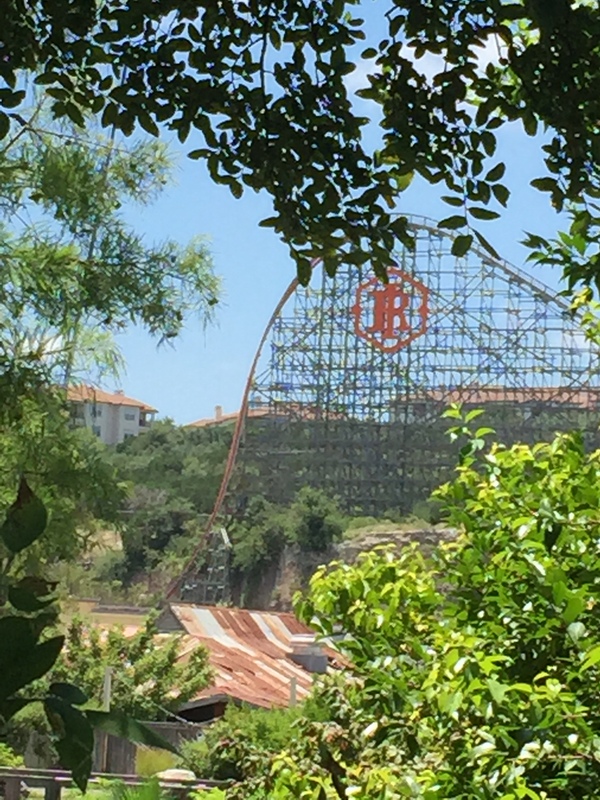 Iron Rattler now has the wooden support structure and a steel track. This combination let the designers do some things that a simple steel or wooden coaster could not. The lift hill ends in a decent in excess of 80 degrees reaching speeds of 70 MPH. The track is a mile long and the air time you get is incredible. The drop from the lift hill on Iron Rattler. The food in Six Flags Fiesta Texas is something completely different. Two of our party had pizza slices and two of us had grilled chicken salads. The pizza was advertised as a brand from a restaurant I have eaten at many times, although mostly in airports. I saw the advertisements and really wanted a slice of my favorite from them. I found out that the park was only serving two of their pizzas, a cheese and a peperoni. The pizza was ok, but overpriced. The grilled chicken salad was also ok and overpriced. The prices for food were comparable to what you would pay for food at Walt Disney World but the quality was not there. I spent a few years as an assistant manager in the restaurant industry and I know when I am being over charged. Another area that I must comment on is ride photos. You know those great pictures taken by computer as you go screaming by on a roller coaster. Six Flags Fiesta Texas, of course takes them also. The difference is this park has seen for to threating their customers that if you snap a picture of the picture with your phone or camera they will charge you $15 and the signs posted even inform you are stealing. I found this offensive. I mean who cares if I take a picture of myself or my kids to post on Facebook, I mean it is me, and aside from the cost of the camera a strobe and some electricity, it has not cost them anything. I mean the picture is taking by a machine, so not artist can really claim that it would by a DMCA violation. I also do not understand why Six Flags would not want pictures of their guest having a good time posted on social media, sounds like free advertising for them to me. A one day adult ticket $69.99 and a child is $49.99 which on the surface doesn’t sound too bad until you take into consideration the cost of food in the park and if you are there on a crowed day and want to get a “Flash Pass” to help with your wait times, then a one day trip is really expensive.